Yesterday Netpicks released a "Forex and Futures Top Ten Trading Secrets Video" + a special Bonus "Insider's Guide" report that really hit home to the 3100+ traders who downloaded and viewed these very helpful guides. Elements such as removing the subjectivity, using one simple indicator instead of many, and grasping an entire new market or trading approach in a matter of days instead of months. The truth about proper leverage, what tools you really must have, and what the brokers just don't tell you, among several other key points we touched on. If you are a trader, and haven't yet downloaded this no-c ost, totally unique and eye opening Myth Busting Video, + bonus report, you absolutely need to go to and get it right away on the Netpicks Ultimate Trading Machine (UTM) blog. As you can see, the blog is live, and it shows the exact results that this strategy you will soon learn about, gets each day. Here, you will see details of the last release on there done in October (this hasn't been available for purchase since), including videos, commentary and more. Plus we will be adding recent videos of trades taken this week as well. If you are at all skeptical - GOOD! You should be. There are many systems that are readily available, making all kinds of claims. But none of them come even close to the UTM, and they will show you specifically why in a just a few days. Wewbcast will be covering specific information about the system, showing charts on how it trades, the markets it covers, why it is so powerful and just how it can be so accurate, as well as the answers to the other unknown's mentioned above. There is a void in the marketplace, and the UTM fills it. While most systems are subjective, and often complicated allowing much room for interpretation, mistakes, and varied results, this is not. We all take the same setups, and we all get the same consistent results. In fact, when NetPicks did their internal launch back in October, the demand was so great, the offer was pulled several days early, as the copies simply sold out. Space is limited to the first 500 registrants, and it will fill up fast. This is an event you don't want to miss. More details will follow upon registration. The cult of Elliott Wave Theory intimidates the most experienced traders. But don't let wave voodoo stop you from adding important elements to your chart analysis. Strong trends routinely print orderly action-reaction waves. EWT uncovers these predictive patterns through their repeating count of 3 primary waves and 2 countertrend ones. Wave impulses correspond with the crowd's emotional participation. A surging 1st Wave represents the fresh enthusiasm of an initial breakout. The new crowd then hesitates and prices drop into a countertrend 2nd Wave. This coils the action for the sudden eruption of a runaway 3rd Wave. Then after another pullback, the manic crowd exhausts itself in a final 5th Wave blowoff. nd line to the downside via a breakaway gap and increased volume, which is bearish. Watch 17.60 for additional confirmation of selling. CY has formed a clear pennant consolidation at the lows after taking a large gap down a month earlier, which is typically very bearish behavior. 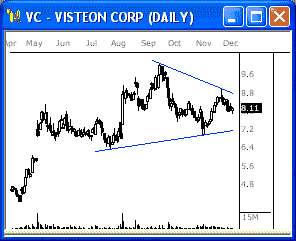 Watch 16.75 for a downside break from this bearish wedge for much more selling potential. Updated Thursday, 12/7 for Friday's market. - Dow bounces off key resistance, drops remainder of session. The index cannot rise above the major 12,350 resistance level, which could make for more sideways-to-down movement within the larger trading range. - The NASDAQ and S&P each sold off the opening highs today, making for steady weakness for much of the session. Each index continues to pull back from key highs, which means we could see further retracing ahead. The Dow ended the day lower after selling opening strength to begin the day. The index continues to hold beneath key resistance at 12,350, which we will continue to watch for a big break or bounce. Further sideways movement could be seen between 12,100 and 12,350. ORCL is breaking a large trend line to the downside via a breakaway gap and increased volume, which is bearish. Watch 17.60 for additional confirmation of selling. TGT has formed a clear consolidation at the highs of the recent overall advance. A breakout from this range in either direction should yield key movement. Watch 59.00 up, and 56.00 down. Updated Wednesday, 12/6 for Thursday's market. - Dow trades slowly sideways throughout session, remains near highs. The index basically held ground throughout the day and eventually closed with a modest 22 point loss. - The NASDAQ and S&P each traded sideways throughout the session today, but are clearly winding up for a potential breakout. Watch their respective consolidations tomorrow. The Dow closed the day very quietly today, but continues to hold near the overall highs, which is bullish. If the index can continue to hold above 12,250, we could see another burst of strength soon. Watch this support level closely. Selection of trading software and trading services that can help you trade better. Find which stocks or options to trade and get accurate Buy/Sell/Sell Short signals to enter and exit trading positions in a timely manner. Whether you are a beginner or an experienced trader this products will be able to help you maximize your potential and returns. Trendlines are perhaps the oldest tools known to chartists. Trendlines form across peaks and valleys called pivot points - relative highs and lows in a chart. As more points form along a line, it becomes more "established". This means that, when the line is broken, it will likely follow through with a strong move in the new direction. CMED has formed a potential head-and-shoulders pattern at the highs, which is a highly bearish pattern. A downside break through 25.00 could spark a test of the neck line at 24.00. Such a break could lead to big selling. BBY is winding up within a large triangle range that could provide some punch. Watch 56.50 up and 53.00 down for a solid breakout opportunity. Updated Tuesday, 12/5 for Wednesday's market. - Dow trades sideways throughout session, continues holding near highs. The index continues to hold near the overall highs just beneath 12,350, but looks a bit over-extended at this point. - The NASDAQ and S&P each traded quietly sideways throughout the session, forming clear consolidations in the process. Look for further development of these ranges before the next key move. The Dow ended the day quietly, as the index basically traded sideways throughout the session. The index continues to hold near highs just beneath key resistance at 12,350, which we will continue to watch for key direction. Are you trading Forex or Futures, but not getting the returns you keep hearing about? What if you could learn from three professional forex and futures traders, the Top Ten reasons that stop people from ever becoming full time traders. Plus, what if they also revealed five little known, yet painfully simple techniques that the successful traders are using every day. Plus, on to of all that, along with the video you will also receive a very special private report dubbed "The Insider's Guide To Trading" written by a 30+ year trading veteran. This brand new report reveals many little known facts that the brokers don't want you to know, major insider secrets, and many other very useful tips that will greatly help you succeed with your trading. Finally, what if it had no cost and no obligation whatsoever. If you'd like to know what works, and what doesn't, common myths busted for good, the top Q&A active traders are burning to know the answers to and much more, you need to see this Video. Ultimate Trading Machine - In just a few seconds you can download a professionally produced video you simply must see, that will not only change the way you trade, but also the approach you take to your trading, forever. CKFR has formed a large triangle pattern that has been winding up for five months now. A breakout from this range should yield big movement. Watch 38.50 down, and 42.50 up. LSI took a large gap down at the Open and sold off the remainder of the day with increased volume, which is quite bearish. Look for more selling ahead. Updated Monday, 12/4 for Tuesday's market. - Dow breaks through 12,250, rallies throughout session. The index continues to look poised for another run at new highs, but needs to hold above 12,200. - The NASDAQ and S&P each rallied steadily throughout most of the session today and look poised for more bullish behavior. Watch for a potential continuation pattern to form near highs for another advance. The Dow closed the day with a nice gain after breaking through the top of the initial triangle at 12,250. However, we could see this pattern build out a bit more before a much bigger move is seen. Watch 12,325 closely tomorrow. SNTS has formed a large head-and-shoulders pattern with a clear neck line (support) at 7.20. A break or bounce in this zone could spark big movement. SWY is holding just beneath key resistance at 31.35, which has held since September. Watch this line closely, as a break or bounce could be big. Updated Friday, 12/1 for Monday's market. - Dow reverses from early decline to end day basically flat. The index reversed sharply from the session's lows and eventually staged a 100 point rally to close the day with a relatively modest 28 point loss. - The NASDAQ and S&P each broke major pennants to the downside to begin the day, but later rallied from big lows to close the day respectfully. Watch the larger patterns for key movement next week. The Dow ended the day with very bullish rally after dipping its toes beneath 12,100. This is a highly bullish sign for the index, especially if 12,250 is crossed with authority. Also watch 12,050 for weakness.